If you know me from our Facebook page or blog, you know that I (Mindy) have always dreamed of having my own horse(s). There is just something about horses that fills those deep places of my heart, stirs my soul and connects me with nature like nothing else. Then one day, I got my chance. A horse came into my life. 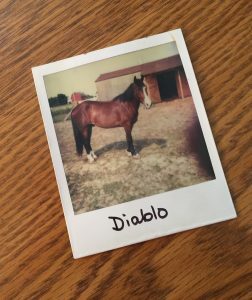 His name was Diablo (the name he came with). He was a Morgan, blind in one eye, 14 hands and about 5 years old (a young gelding that really could have used more training, especially with me as his new mama!) But I loved my handsome boy. 35 years ago, I was not what you would call an “experienced horsewoman”, but I researched my little heart out, and asked a lot of questions before I brought him home to be the “horse of my dreams”. Little did I know that New Year’s Day, when he was delivered to my one stall barn and paddock on our 2.5 acres, that by June of the same year, I would be rushed by ambulance to the hospital with two fractures of the pelvis and six weeks of bed confinement at home. Shortly after, my sweet horse would be re-homed to a lovely family much more suited to care for him at that time. This was definitely NOT in my plans! I was heartbroken. I had failed my horse. I had cared for him for six months faithfully. With no running water in the barn, I carried 5 gallon buckets twice a day to the barn, mucked his stall and made sure he had everything he needed. We were doing so well up until my accident. To this day, I have not ridden or gotten back up on another horse. You know what they say, if you fall off your horse, just get right back up! That was not going to happen with my injuries. But that’s alright. I don’t have to ride. Having a close heart-to-heart relationship with a horse is what I’m really wanting. Horses, like all animals, are great healers and I look forward to being a best friend with a horse in the very near future! My life was still full at that time, working full-time, raising kids and all that a busy household can create will distract one from soon again acting on the soul’s desires. Many years down the road, our children now grown and our plans to create a family educational & recreational farm, I am ready and passionate to go full throttle in the direction of my dreams! So what am I doing to get ready for this next adventure? It’s important, especially when you are breaking into a completely different lifestyle, to make sure you, as a person, are as healthy as you can be to have the stamina needed to follow through on your plans. For me, coming from a 90% sedentary work experience for a major portion of my life and taking little notice to what I was putting in my body, I was lacking in a healthy eating plan, consistent exercise, experience working with horses and having the facilities needed for the animals we will adopt. If I was going to embark on this path of our dream for the farm, some major changes were going to have to be implemented. Actively searching for the right property with an expected move in the fall of 2019! For the past few years, I have experienced some potentially serious health symptoms directly as a result of my sedentary lifestyle. I made a decision; that was not how my story would end. This time…partnering with God, following His lead is the key to staying the course and opening the doors of opportunity and success! My body, soul and spirit is yearning for nature & animal connection, fresh air, wide open spaces…and of course, to have an active lifestyle and having the strength and stamina to efficiently run the farm, care for the animals, offering classes, workshops & programs for the community! It’s amazing how, when you are dedicated to answering the “calls of the heart”, your efforts, no matter how small, contribute mightily to getting you closer to your dream! Finally, after years of struggle, I can say now, we are on our way! Is there a dream you’ve had from childhood that you would like to bring to life? Are you yearning for a change of lifestyle that will energize your body, mind and spirit? Are you afraid that you may never see your dreams realized? Don’t wait! If I can do it, so can you! « Look Up and Trust!